Divide and Ruin: The West’s Imperial Strategy in an Age of Crisis is a collection of articles by British author Dan Glazebrook. Originally published in The Guardian, Morning Star, Counterpunch, Z Magazine and Asia Times, Glazebrook has assembled these writings to illustrate a new strategy by U.S., British and other imperialist powers. This new strategy employs proxy military forces to achieve regime change in any country that resists imperialism. Glazebrook shows the brutality of the West’s racist and exploitative foreign policy against the global South, citing examples from Libya, Syria, and elsewhere in the Middle East, Asia and Africa. He explores in detail the role of AFRICOM as an imperialist force operating on that continent. Economic and social issues in Britain also come under scrutiny, plus the role of the media and social movements there. Divide and Ruin argues for new counterweights to the Empire’s plunder in a winning appeal to reason and humanity. “Dan Glazebrook analyzes a new overarching strategy employed by U.S. and British imperialism since the collapse of the Soviet Union and the end of so-called Cold War. Limited by its relative decline in the context of the global economy and unable to sustain the Bush-like adventurism that led to the Iraq debacle, the Empire, argues Divide and Ruin, seeks now to rely primarily on proxy military forces against those it targets for regime change. The goal though is nothing other than the long-term weakening of any country that serves as a regional counter-weight to the absolute dominance of imperialism. From Glazebrook’s view, U.S. and British foreign policy should be viewed as a wrecking ball of sorts aimed at weakening the strongest and most independent players in the Global South. —Dr. Zak Cope, author of Dimensions of Prejudice: Towards a Political Economy of Bigotry and Divided World Divided Class: Global Political Economy and the Stratification of Labour under Capitalism. 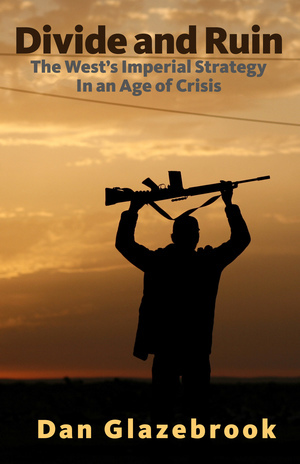 Divide and Ruin: The West’s Imperial Strategy in an Age of Crisis Paperback, 146 pages, $14.95.